Tûranor PlanetSolar, the world&apos;s largest solar boat, is proceeding well on its crossing of the Pacific Ocean. 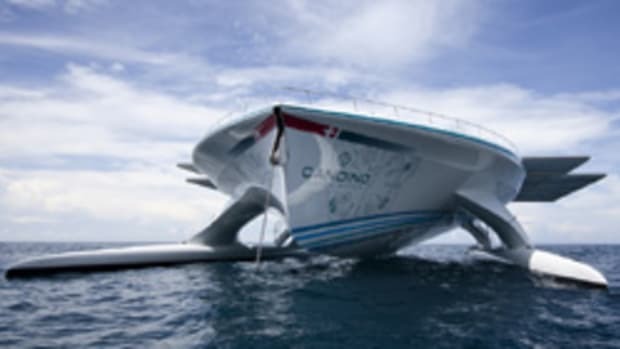 Last Friday, the high-tech catamaran, which is powered by solar energy only, docked at the port of Nuku Hiva on the Marquesas Islands in French Polynesia. Since the departure from the Galápagos archipelago, the four-headed crew consisting of PlanetSolar&apos;s project founder Raphaël Domjan, Captain Patrick Marchesseau, Jens Langwasser and Christian Ochsenbein, spent 25 days, 6 hours and 34 minutes at sea before reaching French Polynesia.